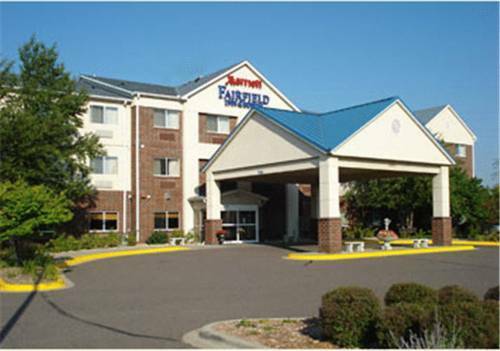 Fairfield Inn by Marriott St Paul Roseville Roseville, Hotel null. Limited Time Offer! Fairfield Inn and Suites by Marriott St. Paul/Roseville. "Fairfield Inn and Suites by Marriott St. Paul/Roseville" has 2 stars. The hotel is a convenient base from which you can discover Roseville. This recently refurbished accommodation has 79 rooms in total. Thanks to the relieving air conditioning, the interior temperature is never uncomfortable. Take advantage of the covered pool. There's no chance of getting bored as the accommodation offers fishing as well as cross-country skiing, waterskiing, snowboarding, ice skating, basketball, alpine skiing and golf. Furthermore, there is a gym, boats and motorboats. For guests' well-being, there is an onsite spa available, a welcome relaxation after your activities. Take a bath in the whirlpool bath. The onsite restaurant will serve you dinner as well as breakfast, which is included in the room's rate. Of course, guests can go online free of charge.